Believed to be native to East Africa, tamarind trees now grow throughout India, South East Asia and the West Indies. They are semi-evergreen tropical trees with long drooping branches and small leaves which are used in cooking as well. The word ‘tamarind’ literally means the date of India, which is an apt description as it plays a very important role in South Indian Cuisine. The pods are ready for harvesting when the flesh inside turns brown. 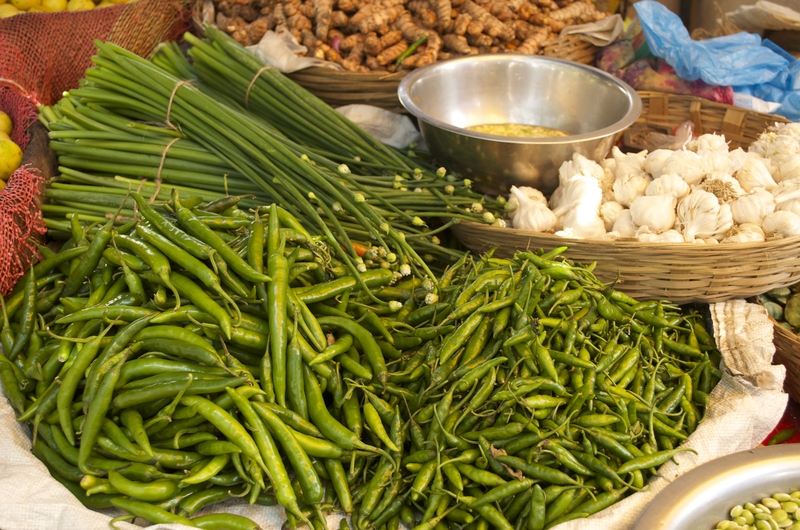 The sticky pulp surrounding the seeds has a high tartaric acid content, and is used as a spice and souring agent throughout India and South East Asia, especially in curries and sweet and sour soups. In the Middle East and the West Indies the pulp is made into refreshing and delicious drinks. In Western cuisine, not many people realize that tamarind is a key ingredient in the popular Worcestershire sauce. 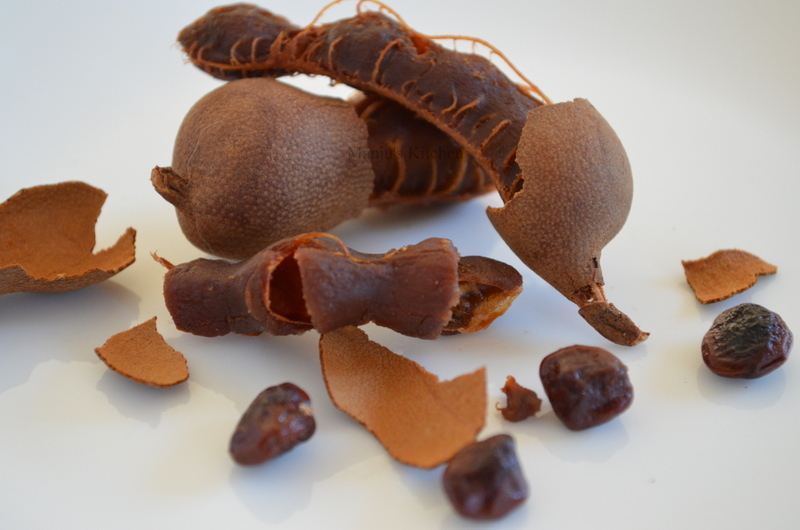 Tamarind is used as a laxative and for stomach upsets in traditional medicine. Ripe fruits can be used to clean and polish copper utensils and brass, which was common practice in South Indian households in the olden days. These days tamarind is readily available in Oriental stores around the world as pods, dried blocks or in concentrated paste form. 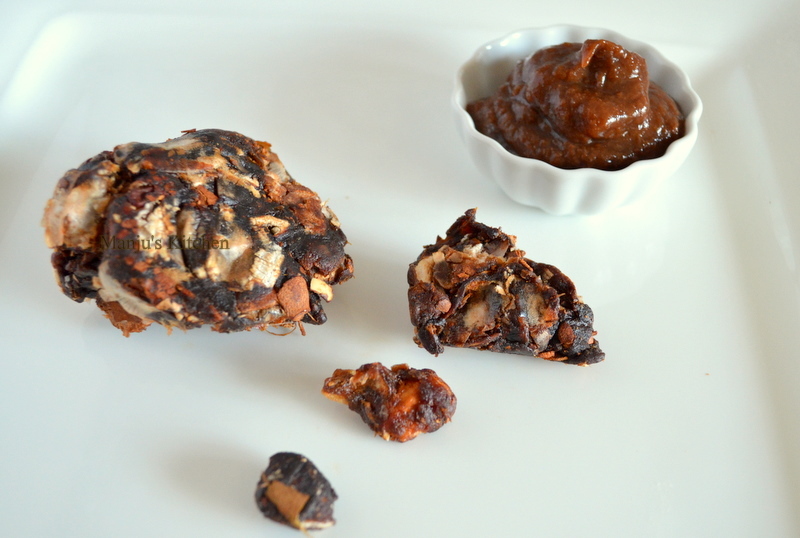 Dried tamarind is the most popular commercially available option and they are pressed into blocks and packed. To use, tear off the equivalent of one tablespoon from the block and soak it in warm water for ten minutes. Squeeze the tamarind with your fingertips so the pulp is released. Strain it through a sieve then discard the seeds, and use the pulp as required. 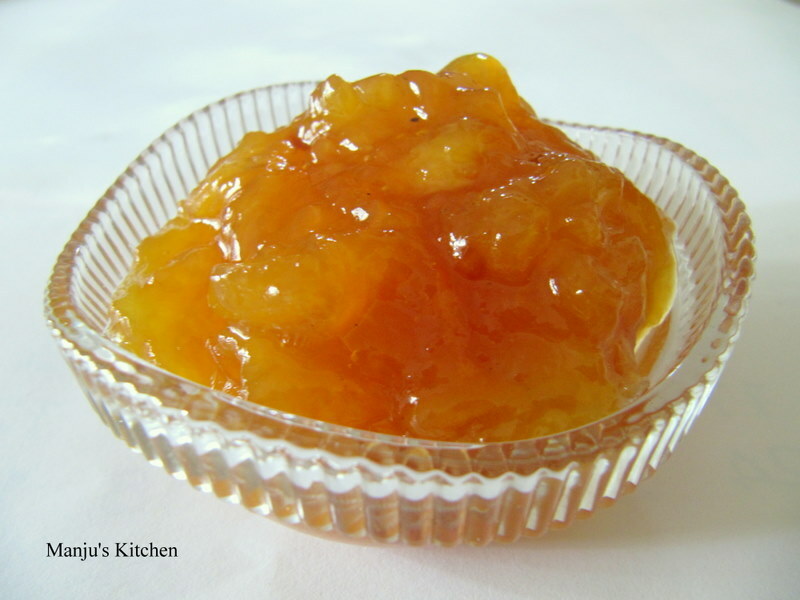 If you are using the concentrate, mix 1 tablespoon with ¼ cup of water and use as required. When buying the concentrated version, I prefer to use brands with no citric acid added to the concentrate, as citric acid adds a very resilient artificial aftertaste. 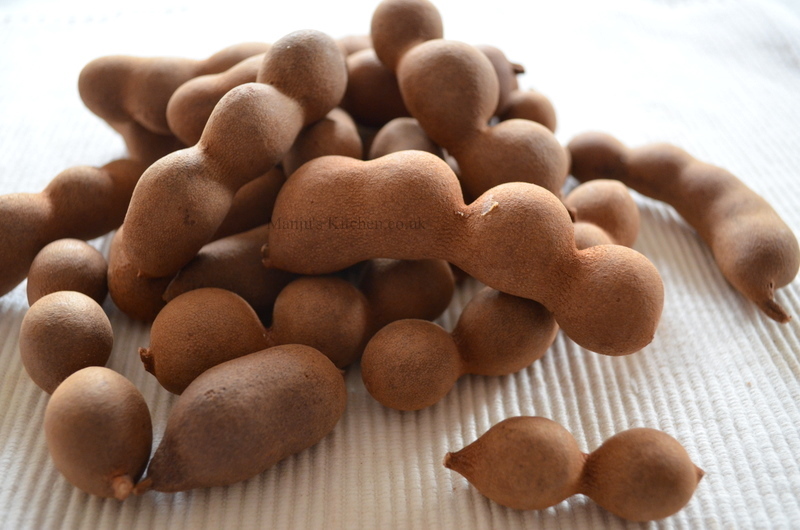 The flavour of the tamarind is very sour yet fruity and refreshing. Some recipes that have been adapted for western kitchens suggest substituting lemon juice for tamarind, but if you know the taste of tamarind, it alone will serve. 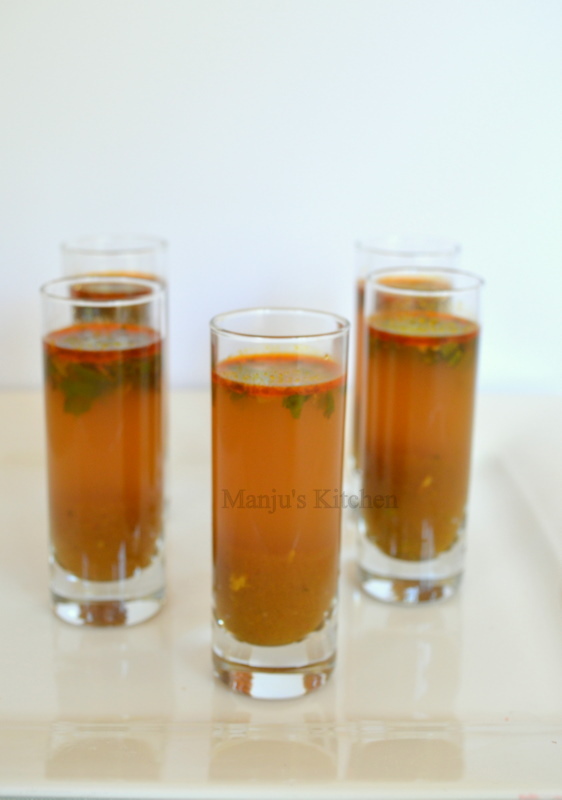 Rasam is a traditional South Indian spicy vegetarian soup-like dish, made with tamarind pulp, and a mixture of spices. In South India, people usually complement it with plain rice for a light meal or serve it as a course for traditional vegetarian feasts (sadya). You can serve it as a soup or a light starter for a meal if you prefer and that’s what I do these days – I serve it in shot glasses as a starter for dinner parties….. Make sure you have enough to refill the glasses as they are very popular! Crush cumin seeds, peppercorns and garlic together in a pestle and mortar and keep aside. Heat ghee in a sauce pan and fry mustard seeds until they pops, add crushed ingredients and sauté until fragrant. Add chilli powder, coriander powder, turmeric powder and asafoetida and sauté in low flame and add tamarind juiceand water. Cook covered for ten to fifteen minutes. Add coriander leaf and salt to finish.